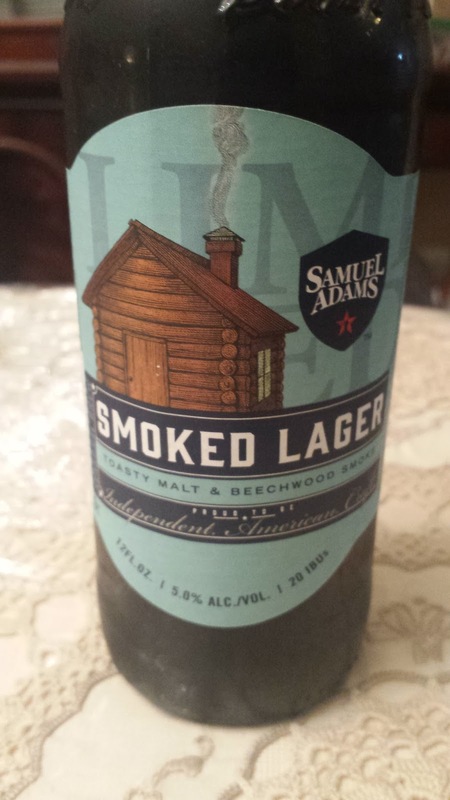 This week's Sunday Night Suds looks at Samuel Adams Smoked Lager. The Smoked Lager is one of the three new beers in the American Craft Lagers Variety Pack, which also includes Kellerbier (reviewed here http://kosherbeers.blogspot.com/2018/01/sunday-night-suds-samuel-adams.html ), Coffee Black Lager as well as old friends Boston Lager, Fresh as Helles and Noble Pils. The Smoked Lager is not the first smoked beer that I have tried, but its miles ahead of the first that I ever tried. About nine years ago I sampled the Shiner Smokehaus (reviewed here http://kosherbeers.blogspot.com/2009/11/belated-sunday-night-suds-shiner.html) which tasted like a barbecue in a bottle, and not in a good way. In contrast, the Smoked Lager tasted like a cross between a Laphroag and a lager. There was definitely some smoke, but it was also refined and reminded me of a fine, peaty, single malt scotch. Not that the beer was especially high in alcohol as the alcohol level was only 5.00% abv, but there were notes that made me think scotch. I had this beer with meatballs and spaghetti and the smokiness of the beer matched well with the smokiness of the browned meatballs. I could see having this with other rich smoky meat dishes and would suspect that it go well with the tongue that Mom of KB used to make. The Smoked Lager is under the Kosher Supervision of the Star-K and has a Star-K certification mark on the bottle. To see what the experts on Beer Advocate think about this brew, please follow this link - beeradvocate.com/beer/profile/35/304490. Speaking of the beer list, I hope to Iyh post the newest version of the list tomorrow.